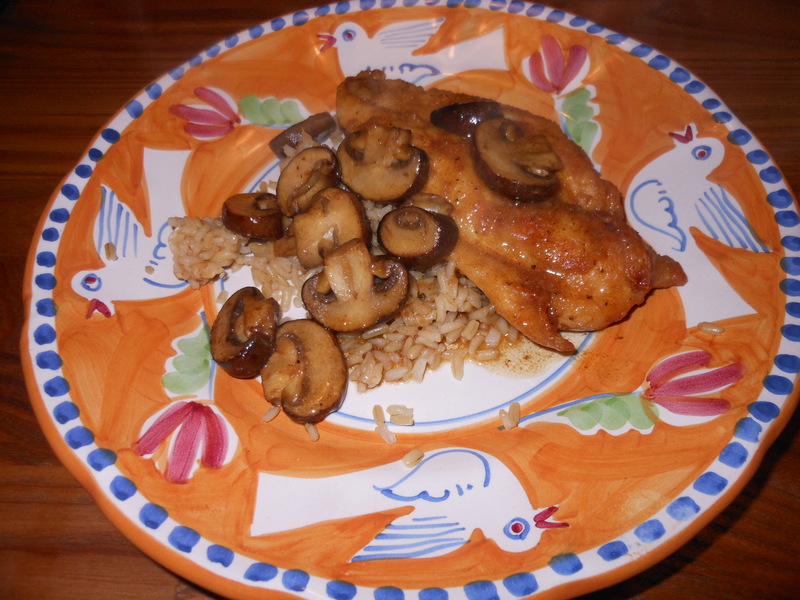 One night last week I prepared a version of Chicken Marsala which came out totally delicious, and worthy of posting this recipe. I am always trying out new recipes for this dish. I combined about 3 recipes and I must say this final recipe worked out just perfectly. I served it with a plain brown rice which worked out nicely. A green salad or a green vegetable would make this all the more perfect! I used 1 package thin chicken cutlets ( 5 pieces ) about 1 1/2 lbs. 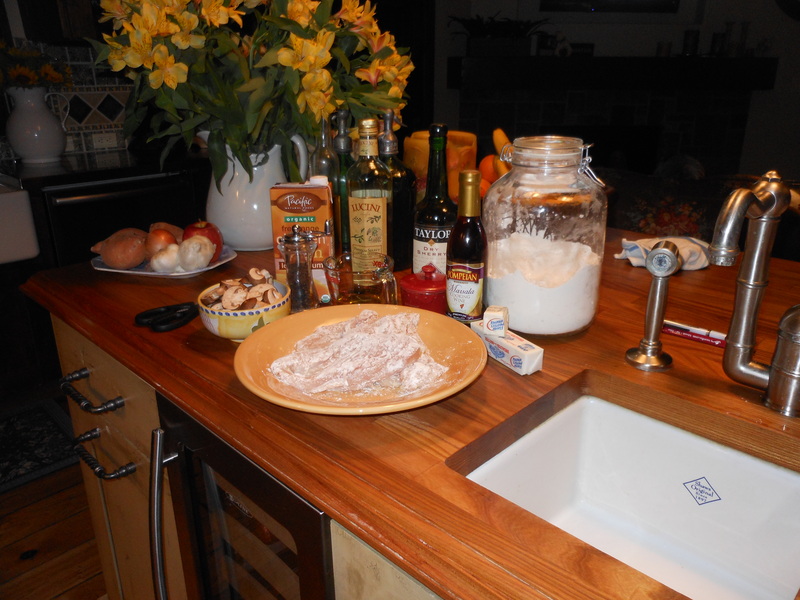 In a shallow bowl or large plate, mix together the flour, salt, pepper, and oregano. coat chicken pieces in the flour mixture. In a large skillet, melt butter in olive oil over medium heat. When oil is hot place chicken in the pan and lightly brown. A little hint, don’t futz with the chicken , place it in ( make sure the oil is very hot) and let it be , turn after about 5 minutes, it should be a light golden brown, then do the same for the other side. Use tongs , try not to pierce the skin of the chicken. Remove chicken to a plate, I take paper towel and blot it. Lower the heat, put mushrooms in pan. I sprinkle a little salt on the mushrooms. Cook mushrooms for about 5 minutes till their moisture has evaporated, and then de-glaze the pan with the sherry, Marsala, and the chicken broth. Let it cook for another few minutes. The sauce will reduce slightly. Return the chicken to the pan, cover the pan and simmer gently for about 10 minutes, turning once. Before you serve sprinkle some chopped parsley on it if you like. I served over brown rice. One night last week I prepared a version of Chicken Marsala which came out totally delicious, and worthy of posting this recipe. I am always trying out new recipes for this dish. I combined about 3 recipes and I must say this final recipe worked out just perfectly. It would have been more perfect with a green vegetable served alongside, like brussel sprouts but it was sort of last minute and didn’t have the veggies, which was just fine with Joel. I served it with a plain brown rice which worked out nicely. Lower the heat, put mushrooms in pan. I sprinkle a little salt on the mushrooms. Cook mushrooms for about 5 minutes till their moisture has evaporated, and then deglaze the pan with the sherry, Marsala, and the chicken broth. Let it cook for another few minutes. The sauce will reduce slightly. Return the chicken to the pan, cover the pan and simmer gently for about 10 minutes, turning once. Before you serve sprinkle some chopped parsley on it if you like. I served over brown rice.